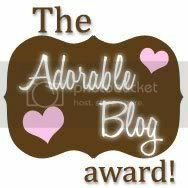 Adorable Blog Award - Cherry Colors - Cosmetics Heaven! Omg, thank you so much WinWin, it's sooooo sweet from you - she gave me a blog award! But not any blog award, this is Adorable Blog award! Omg! I got it from Innerchild too! And from the super adorable Miss LeeAnn too <3! !